Polydefkis Loukopoulos is the Chairman and Managing Director of Philips Lighting Hellas S.A. covering the area of Greece, Israel, Cyprus and Malta. 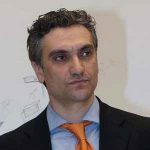 He joined Philips in 2010 as the General Manager of the Greek Lighting sector and served as the Vice Chairman of Philips Hellas S.A. from 2013 until his current appointment in 2016. He also serves as a board member at Appliances Recycling S.A. since 2010. Before joining Philips he worked for Schneider Electric since 1998 in various commercial positions in the fields of Industrial Automation, Building Automation and Electrical Distribution and launched the Energy Efficiency and Services business in the Greek market. He started his professional career as an Engineer at Endress & Hauser in 1995 following a 2 years service as an Army Officer for the Greek Special Forces, Parachutists Corps. He holds a Masters degree in Electrical Engineering (Energy) from Aristotle University and an MBA from Warwick University U.K.